► Is it a Porsche 911, S-class or DB11 rival? The number eight has only ever been applied to stuff in the posher, pricier and quirkier realms of BMW’s portfolio – the Z8, i8, and indeed the original BMW 8-series coupe of 1989-1996. Now it’s back. So this is essentially a 7-series coupe, right? Absolutely not, protests BMW; although the 8-series uses elements of the same structure as the 5- and 7-series, it was always intended to be considered a new, separate model in its own right, to be thought of more as a sporting grand tourer than as a luxury car. Munich argues it’s also not to be considered a replacement for the old 6-series, as the 8-series sits higher up the scale in terms of cost and capability. The new BMW 8-series will be available in three body styles: two-door 2+2 Coupe, Convertible and four-door Gran Coupe. The upcoming BMW M8 will be available in the same three costumes. The M8 is still maybe another year away at the time of writing, due for launch in late 2019. A choice of two engines: a twin-turbo 4.4-litre V8 petrol in the BMW M850i, or a 3.0-litre straight-six turbodiesel in the 840d. Here we’re testing the M850i. The M850i’s M prefix labels it as an ‘M Performance’ model, rather than a full M Division-developed car, as the M8 will be. All 8-series models are all-wheel drive, under BMW’s ‘xDrive’ banner, but are very much rear-biased. In steady-state driving they’re purely rear-wheel drive, bundling torque to the front when required. Unlike the current BMW M5, you can’t flick a switch and make them rear-drive only for tail-out hooliganism, in-keeping with the 8-series primary remit as a comfortable Grand Tourer rather than a supercar-baiter. The 8-series platform has potential to accommodate a hybrid powertrain, but that’s not planned for now. 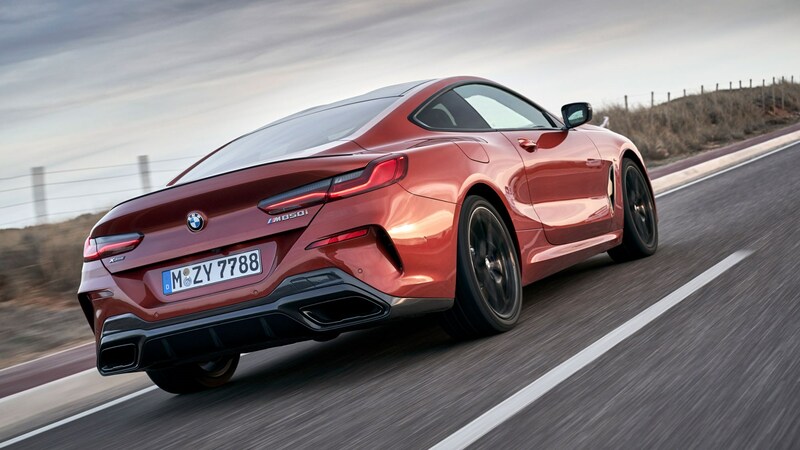 How much does the BMW M850i cost in the UK? One-hundred grand, plus options. Or £76,270 for the BMW 840d. A lot of wedge, and no mistake. Does it feel worth the cash? Interior quality is difficult to fault – fit and finish are excellent, as are ergonomics with multiple ways to control the latest iDrive 7.0 infotainment, from voice, gesture and finger-tracing scribing to good old-fashioned buttons. All are intuitive, and the system is hooked up to some of the latest self-driving tech, including a new Reverse Assistant function, which can retrace the car’s path in reverse if you’ve driven forwards into a tricky spot; you work the pedals, it does the steering for you. 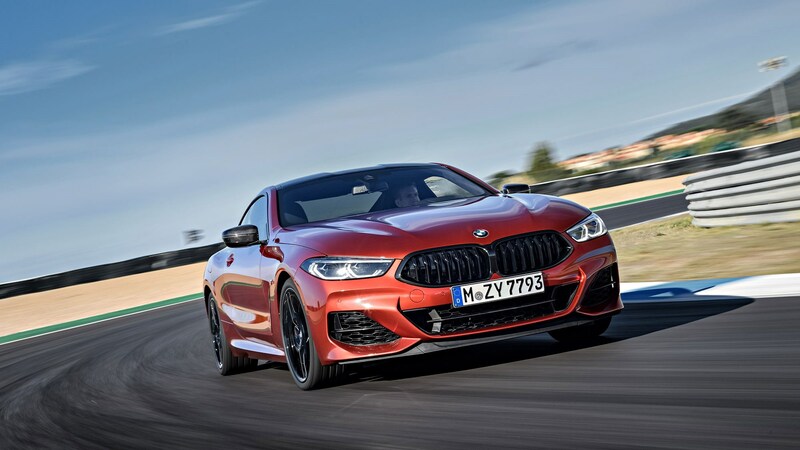 The seating position is notably low; 8-series project manager Bernd Limmer told CAR it was the first starting point of the design, and tyres the next; specially developed mixed-width 20-inch Bridgestones. Semi-chintzy glass for the gearlever and starter button lift the ambience out of the ordinary, although the overall impression is of a mainstream luxury saloon rather than a bespoke sports car. The exterior, too, looks more saloon than coupe to these eyes, but the roofline’s low, fast arc is undeniably striking in the metal, as are the wide shoulders, short overhangs and what are currently the slimmest headlights in the BMW group. Can a full-size human fit in the back seats? Not really. A five-foot-ten adult will have their head comprehensively squashed, and the rear seats are best reserved for kids or particularly flexible adults for short trips. You can fit a fair bit of luggage in the boot, and carry long items with the rear seat backs folded down, released by remote handles in the boot, although you’d need to negotiate past the rear screen’s low-set bottom edge to get them in. Taken at face value, it’s a supremely relaxing car to waft about in, a few fingers resting lightly on the fat-rimmed steering wheel, enjoying how little lock is required to negotiate tighter turns (partly a facet of the standard rear-wheel steering, which can feel a little odd at roundabouts on first acquaintance but quickly feels normal). The V8 sounds pretty good, albeit muted; a mellow, cultured baritone, popping and rumbling slightly synthetically on the overrun through the electronically controlled flaps within its exhausts. As with most modern BMWs, switchable modes for steering, dampers and powertrain mapping ramp up from Comfort through Sport to Sport+. In the latter two modes, body control is remarkably good, with impressively tidy handling for such a large, heavy car, hinting that it’s capable of more than it might appear. To demonstrate its confidence in the 8-series’ handling, BMW’s launch took in driving on-circuit as well as on the road. Estoril is a superb track, full of big stops, long multi-apex technical corners and high-entry-speed brave bits. We followed a BMW M5 Competition pace car driven by works BMW DTM hotshoe Bruno Spengler, and he wasn’t hanging about. The 8-series acquitted itself surprisingly well. Particularly impressive are the brakes; made of steel (the M8 may feature ceramics) and the same generous size front and rear, they stand up remarkably well to continued punishment on track. They already smelled hot when CAR climbed in, but the pedal’s travel never changed throughout the session and once the front tyres were up to temperature there was never any doubt the 8-er was going to stop, and stop well. Even with the standard-fit adaptive dampers set to their firmest mode, there’s plenty of weight transfer going on (the M850i does weigh around 1.9 tonnes, after all), but it’s well managed, and gives you plenty of options to manipulate the car’s attitude between turn-in and apex. The suspension’s stroke is well-controlled while the car is loaded up, too, making it happy to take plenty of kerb mid-corner and on exit without upsetting its overall balance. An electronically controlled locking differential is standard, and with the stability control system switched into halfway-off ‘Traction’ mode, or all the way off, the M850’s natural pose is to exit corner with a slight whiff of oversteer on the go. Its long wheelbase lends it predictability and it’s fun, safe, and quick in a straight line too – quick enough to keep a reasonably hard-worked M5 in sight. BMW says its internal nickname for the 8-series while it was being developed was ‘the gentleman racer’, both luxurious and exciting to drive. Despite its impressive on-track abilities, however, it feels more like an exec than a sports car on the road, to this tester at least. It could perhaps possess a little more drama and sense of occasion in return for its six-figure asking price. BMW doesn’t consider it to be an S-class Coupe rival, because it rates the 8-series as ‘on another level’ for driving dynamics and agility. In fact it considers Aston Martin’s DB11 to be its closest competitor in ethos, but the Aston is considerably more expensive. 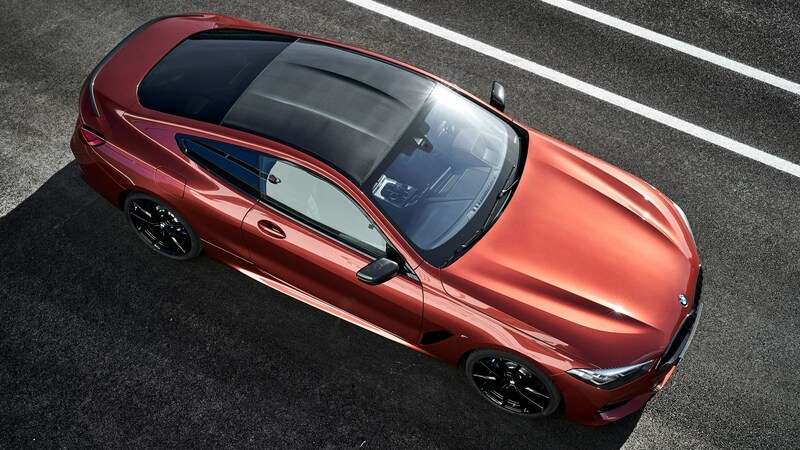 Arguably considerably more exciting, too, but the 8-series has been designed with a broad spread of use in mind. ‘For some customers it’s a toy; they might have five or six cars in their garage. For some, it will be their only car,’ says BMW luxury product boss Carsten Groeber. Even if it is perhaps missing a little drama, the new 8-series is a dynamically impressive, well-rounded machine. The days of big coupes with big engines may be numbered; perhaps we should enjoy, and admire, this car while we can.